The landmark musicals of theater history haven’t fared very well on film. Usually, they’ve had their scores trashed (such as Lady in the Dark and Pal Joey), suffered from big-movie-star miscasting (such as Guys and Dolls, Gypsy and Chicago) or been presented intact but with such fussy over-fidelity that they’re dead on the screen (such as South Pacific and My Fair Lady). So it’s something of a miracle that the first great musical, maybe the greatest stage musical of all — Show Boat, by Jerome Kern and Oscar Hammerstein — reached movie theaters with its beautiful score intact, with the best and most legendary cast members playing their original roles, and filmed with cinematic intelligence by a great director. And most miraculously of all, the movie Show Boat came from the cheapest, blandest and most mediocre studio in Hollywood history — Universal Pictures. Universal had tried before in 1929. They had bought the film rights to Edna Ferber’s 1926 novel, which had been a big best seller, and were filming a silent version when lightning struck twice. First, Ferber sold the stage rights to Florenz Ziegfeld and the resulting musical became Broadway’s biggest hit and a groundbreaking leap forward in terms of seriousness of story and theme. Second, the movies were swept by the craze for talking pictures. So here was Universal, having just finished making a silent version of a book for a public that wanted to see a famous musical. The solution was to add a talking prologue, with songs performed by a few original cast members, like a variety show, and shoehorn a couple of songs by other composers into the movie randomly. Though it was a financial success, the result was widely regarded as a hodgepodge and an artistic failure, as it is today. I’d be hard pressed to think of another time in the history of movies that something like this happened, but Carl Laemmle, the head of Universal, decided to try again and do it right. Only seven years after the first film, he hired Oscar Hammerstein, who had written Show Boat’s libretto, to write a screenplay with story and songs true to the original. The score was largely retained; a couple of fine new Hammerstein/Kern songs were added (in fact the two went on adding and subtracting songs to Show Boat into the 1940s). Paul Robeson and Helen Morgan were signed to repeat their stage performances, which was very brave of the studio — Robeson was a pariah due to his left wing politics and refusal to kowtow to anyone; Morgan was on a career slide due to alcoholism, and Hollywood had long since washed its hands of her. The decision to include them shows how serious Laemmle was about rectifying his earlier error. And so Show Boat offers the opportunity to see two of the most legendary performances in the history of American musical theater in one film. Laemmle also put his best director on the project. James Whale is famous for a quartet of Universal monster movies (Frankenstein, Bride of Frankenstein, The Old Dark House and The Invisible Man), so much so that horror has taken over his resume. But what makes his horror films among the best, if not the best, is the kinetic aliveness of his direction (which sometimes meant that his shots don’t match; the film’s only flaw is that it’s choppy in places). Show Boat could have been a static record of a famous stage production, but in Whale’s hands, it’s a movie. There’s so much going on in every frame that it almost feels like 3-D, and you’re always aware of the characters watching each other and reacting to each other. When Helen Morgan sings her great torch song “Bill,” with its famous lyric by P.G. Wodehouse, chorus girls, janitors and washerwomen slowly stop their work and gather at the edges of the room; one discreetly wipes away a tear with her apron. When Paul Robeson sits on a dock and sings “Ol’ Man River,” maybe the most famous performance of the most famous song in theater history, Whale’s camera circles him ecstatically, finally ending on a sustained closeup that you hope will never end. Sadly, it does: someone foolishly intercut scenes of Robeson acting out the lyric (toting barges, lifting bales, getting a little drunk and landing in jail). But then we go back to Robeson singing, and it’s one of the most beautiful, stirring sights anyone ever saw. The leads are great as well. It can’t be the easiest thing in the world to play Magnolia Hawkes and Gaylord Ravenal, Southern belle and riverboat gambler, and not look just a little bit ridiculous. And singing, yet. I’m not a big fan of operetta, with its stilted and formal performance style, but Irene Dunne and Allan Jones are the two best performers who ever attempted it. Dunne is particularly skillful, convincingly aging from innocent late teens to worldly wise 50s (she was about 38) without hitting a single false note. She does a crazy, eye-rolling shuffle to “Can’t Help Lovin’ Dat Man” and performs “Gallivantin’ Around” in blackface, and manages to keep her dignity as an actress and keep you focused on Magnolia, not on Irene Dunne. And it must be said that she never looked more girlish or more radiantly beautiful than in this film. If Jones is remembered at all today, it’s as the only bearable male lead in the Marx Brothers’ film career (in A Night at the Opera and A Day at the Races). In Show Boat, he has a tricky role, as a riverboat dandy who’s dashing and charming but also weak and irresponsible. He’s a gambler who loses spectacularly, and losing doesn’t bring out the best in him. He’s much softer than Magnolia, who turns out to be the strong and resilient one. Late in the movie, he takes a menial position just to be around his grown daughter, who doesn’t know him. You accept this melodramatic, masochistic turn of events largely because of the gentleness and simplicity Jones brings to it. His daughter is his legacy; she’s all he has. He makes you understand that Ravenal is a sensitive man who doesn’t like himself very much and clings to a dignity he doesn’t really feel; it’s a terrific, subtle performance. But everybody in Show Boat is great. As Magnolia’s parents Captain Andy and Parthenia, Charles Winninger and Helen Westley bring out all the comedy and pathos in their parts without overdoing it. Not easy: in the MGM remake from 1951, it’s hard to even look at Joe E. Brown and Agnes Moorehead thrashing around in the same roles. Winninger is particularly outstanding in a scene near the end where he saves his daughter’s singing career by coaching her from the footlights, and his emotion is so full that he can only express it by leading the entire audience in a sing-along reprise. All through the movie, song is a vehicle for emotion rather than an excuse to wow you with a big production number. “Make Believe,” the gorgeous love song that brings Magnolia and Ravenal together, also is a brilliant foreshadowing of their self-delusion and ultimate missed connection. Maybe the most remarkable thing about Show Boat is the relationships between the black and white characters. In no other ’30s movie, and maybe no other movie before the 1970s, do blacks and whites mingle so freely and with so much ease. Though the movie shows you a world in which African Americans are subservient, poor and ignorant, it’s not trafficking in stereotypes or endorsing prejudice. Far from it. The most sympathetic character is Julie (Morgan), who has mixed blood and loses her job and her husband after being hounded by the law. The movie, like the show, is suffused with the idea that racism is evil, ugly, and ruinous. The characters, living in the post-Civil War South, can’t change the world around them but nonetheless treat each other like human beings. 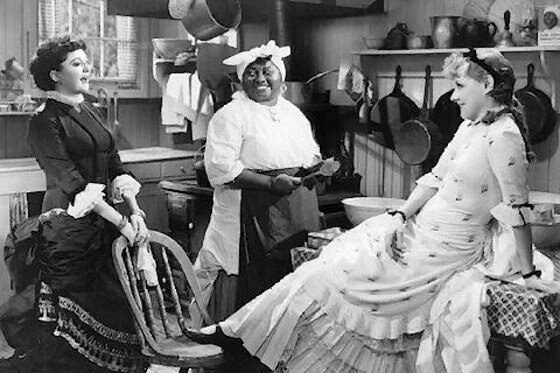 When Irene Dunne does her shuffle and her blackface number, it isn’t condescending — Magnolia has been brought up and nurtured by African Americans; she’s one of them. Quite a progressive movie for 1936, and for a minor studio in some financial trouble. Laemmle had a lot riding on Show Boat. Like Ravenal, he was a gambler. And he lost: the movie was a hit, but due to the time and care he’d invested, it was so expensive that it failed to turn a profit. As a result, the receivers moved in and he was ousted from the studio he had founded. But again, like Ravenal, he left quite a legacy. Show Boat is many things… an irreplaceable record of a key moment in theatrical history, a high point in classical Hollywood filmmaking, a moving bit of make believe, and an eloquent understated plea for tolerance and decency. And for all its antiquated technique and performing style, maybe the finest movie musical ever made.